"The ecclesial reality of today". The "ecclesial reality of today" is infected and darkened with "diabolical disorientation" from which may Christ rescue us. I wonder if there comes a time when subscribing and adhering to the various and sundry pastoral advices, counsels, permissions, and admonitions of a particular Pope effectively places oneself outside the One, Holy, Catholic, and Apostolic Church and in danger of damnation. During two millennia, there has been quite a number of very bad popes. There has been quite a number of very good popes. There have been hundreds of ordinary, unremarkable popes. A pope can speak infallibly but only in the limited circumstances described by Vatican I. Unity with the Petrine Roman Church is an efficacious sign of the Unity of the Church Militant. POPES DON'T REALLY MATTER VERY MUCH. Don't get excited about popes. There is a magazine published and distributed in Scotland called ‘Open House’. It publishes articles from Catholics who possibly find Professor Beattie a bit too traditionalist, liberal Protestants and sisters who would dearly like to be on the bus. Its favourite words are dialogue and ecumenism. 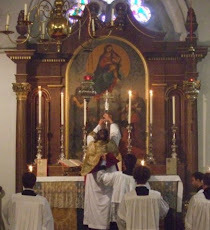 It is a wonderful example of the non-diversity which Fr Hunwicke has described. I find your last sentence very interesting indeed, Father. A layman whom I used to know, a fellow very much involved with ecumenical activities in Rome (such as they are) used to say that an "ecumenism of return" could be justified in only one case, that of the SSPX. Thank you for your clear and gracious reply with which I fully agree. My concern is that there are so very many Faithful who might not be sufficiently catechized to draw the necessary distinctions. To be sure there were good, bad, and also-ran popes in times past but the reach and impact of their day-to-day utterances and actions (be they heretical, imprudent, or heroic) were largely a function of the means of reporting and recording same. Until, say 1960, the average Catholic rarely ever saw the Pope on the television or heard him on the radio. Today, the means of mass communication are such that every sundry pastoral advice, counsel, permission, and admonition of a pope (heretical, ignorant, or measured) are blared instantly around the world for all mankind, theologically sophisticated or not, to consider as the 'Catholic' position on this or that. Unlike 1916 or 1816, this year of Our Lord 2016 offers theological error the supreme and unique opportunity to universally disseminate and propagate. St. Paul assures us there will be a great and universal apostasy. This Petri dish is well along with the culture it has been incubating, I fear. The availability of the Pope ought to give us pause. It means far greater weight is given to offhand remarks that wouldn't have even been made in the past. This makes the crisis of John XXII remarkable: the Franciscans were already battling him over their way of life, but they were theologically well-equipped to rebut his view of the beatific vision, which he recanted. But as Fr. Hunwicke has said, he was a good administrator and did well liturgically. This over emphasis on every utterance of a reigning pope is very prevalent among the pastoral clergy. It has been a growing tendency throughout the last two or three pontificates, but it seems to have reached fever pitch just now. In fact it is becoming very rare to hear a parish sermon that does not include frequent phrases such "Pope Francis says ...", "Pope Francis wants ...", "Pope Francis is leading us to ...". I don't have a problem with the Holy Father being mentioned occasionally in sermons, of course, but it is beginning to sound like a personality cult rather than the Catholic Faith centred on Jesus Christ. @Thomas: "it is beginning to sound like a personality cult rather than the Catholic Faith centred on Jesus Christ." - this is nothing new. There was a personality cult around Pope John Paul II. Further to the point about the FSSP not having their own bishop; I suspect this is part of the realities of modern church life referred to earlier. There is no earthly reason why they should have their own bishop, any more than that the Oratorians should have one of their own, and there seems to be no shortage of bishops willing to ordain their candidates. "POPES DON'T REALLY MATTER VERY MUCH"
In Solidarity with all our Holy Priests, and all due respect to Fr. Hunwicke, as the definition of a Practical Catholic requirements include in Communion with the Holy See. Loyalty and Obedience to the One Holy Catholic Church of Almighty God is part of every valid Ordination not only to the Ordinary delegated authority to ordain Priests, but also in Communion with the Holy See. His particular FSSP Apostolate would have absolutely no standing without PERMISSION and RECOGNITION from the Supreme Pontiff of Rome. Guidance to the faithful such as this even by clergy such as Fr. Hunwicke is why there is such divisive and confusion among the Body of Christ. Please promote complete true Catholic Hierarchy and teachings. Without St John Paul II and Benedict XVI Moto Proprio, his standing within the Universal Church founded by Jesus Christ on the Rock of Peter, would have no meaning whatsoever. Unity and Fraternity even among Ordained Clergy has a Divinely designated Leader on Earth, Christ's Vicar, Our Supreme Pontiff, the Pope. I pray Fr. Hunwicke humbly clarifies this comment to all Catholic Faithful. The context of any remark is of supreme importance in understanding any point being made carefully. May I suggest you revisit the totality of the posting of Father and reflect a bit more? Nuance (a thing given short shrift these days)can be discerned if one is pre-disposed and agreeable to look for it. Thank you for your helpful comment. I must correct one erroneous suggestion: loyalty and obedience to the Church are not necessary for valid Ordination. To suggest that they are is to fall into an error condemned by popes since the third century. I am happy to clarify my words to which you took exception. Until modern media came along, I doubt if most ordinary Catholics, certainly lay Catholics, knew anything about the pope, or heard much about him from one year's end to the next. They knew that he was 'head' of the Church Militant. Now, however, popes give interviews in airliners and pope Francis preaches a sermon every morning which Vatican Radio shares instantly with the whole world. And his words are such that very many people either do not understand them or are upset by them or both. When popes spoke very rarely and very carefully, it was natural to weigh every word they said with immense care and respect. I do not believe that Pope Francis expects the hundreds of words which he utters every day to be treated as if they were infallible oracles guranteed by the Holy Spirit to be of immediate relevance to every Catholic in the world, or expects every Catholic to spend lots of time each day puzzling them out. I doubt whether he would be worried to be told that ordinary Catholics don't have the time to do that if they are to spend some time praying and reading their Bibles, working to support their families, and being good fathers to their children and good husbands to their wives. And, given the Holy Father's verbal output, I doubt if he himself has spent hours checking every aspect of every word he says. There are only 24 hours in his day, too. That is the sense in which I do urge people not to get terribly upset when the Holy Father says something which appears to contradict what they have been taught or what the creeds and the decrees of Councils and earlier popes have taught. Calm down, and get on with the plain simple leading of the Catholic life, is what I do advise people who are driven to despair or to the edge of apostasy by something Pope Francis is reported to have said. Father John Emerson began his studies for the priesthood with the Dominicans after graduating from the University of California at Berkeley with a major in history. In 1979 he left the Dominicans and the U.S. for the seminary of the Society of St. Pius X in Econe, Switzerland. There he was ordained a priest by Abp. Marcel Lefebvre in 1981. He is now a priest of the Society of St. Peter. It came into being on July 18, 1988, at a meeting at the Cistercian Abbey of Hauterive near Fribourg, Switzerland. We met there — I wasn't yet a member, so I wasn't there — the Society met there, about 10 priests and a number of seminarians, all of them, except one or two, persons who had just left the Society of St. Pius X because of the schismatic consecration of four bishops by Archbishop Lefebvre. They were all convinced this was not simply a further necessary disobedience in order to keep tradition alive, but a true break with Rome, and they could not in conscience go along with it — particularly after Rome had offered everything that Archbishop Lefebvre had ever wanted of substance. Rome had offered it all, and we were scandalized he refused it, truly scandalized. We weren’t simply surprised or unhappy, we were scandalized because he was our spiritual father and we trusted him, and he did not do in the end what was right. ..
Q. Okay, you're emphasizing liturgical matters. Let me put something else to you. Really, it's a question in two stages. First stage: Does the Society operate exactly as the Society of St. Pius X would have under terms of the May 5, 1988 agreement [signed by Cdl. Ratzinger and Abp. Lefebvre], had the archbishop stuck with that? Yes, except that he would have had a bishop and we do not. In other words, he would have had a bishop who would have been consecrated for the Society and for the traditionalist movement worldwide. We have to depend upon — and there has been absolutely no difficulty — local bishops or Curia cardinals or bishops who are willing to come and do the Ordinations and Confirmations and so on for us. Q.Do you envision the day when you may have a bishop? A. Well, yes, Rome talks of it for the future. For now it would be rather ridiculous for a community of 20 priests and 30 seminarians, as we are now, to have our own bishop. It was sensible for the Society of St. Pius X with 10 times that number. So, when do they get a Bishop? ABS thinks a song by Johnny Mathis might five us a clue. The song, is "The twelfth of never." Very useful post. Thank you. I would suggest that Johnny Mathis' "It's Not for Me to Say" might apply too. "There is no earthly reason why they should have their own bishop, any more than that the Oratorians should have one of their own, and there seems to be no shortage of bishops willing to ordain their candidates." When the Fraternity was founded in July 1988 with only 12 members, not all of them even priests, this argument may well have made some sense, as it did when Fr. Emerson, quoted above, was speaking as well. But today, they have 421 members (257 incardinated), of whom 262 are priests, 14 are deacons and 145 are seminarians - which is more than many dioceses have. They certainly have reached the size that would more than justify having their own bishop. It is well and good that other bishops have proven willing to ordain their priests, but this cannot always be guaranteed. Fr. Hunwicke is totally right affirming that “Until modern media came along, most ordinary Catholics knew anything about the pope”. It’s well known that, when Blessed Giacinta Marto were told by Our Lady of Fatima to pray for the Pope, she not only did not know “who” was the pope of that time, but even ignored “what” was a Pope. And she was from a Catholic family among a very Catholic society. Then, it’s reported, when she was explained “what” the Pope was, she was so pleased to know it that she start praying and making sacrifice for him all the time. So, one could be chosen by the Mother of God even if ignore the Pope existence, because if one is in communion with Her Son is automatically in communion with His Vicar and His Church. The only problem is that millions of people are being misled. Not trivial.